Before attempting to eliminate any undesirable behavior your pet may presently have, you must first understand The Rules of Punishment. Many owners listened to the well-meaning advice from friends and relatives on how to punish an animal for inappropriate behavior, then found themselves with an escalation of the original problem or the adoption of an even less desirable replacement behavior. However, close adherence to these instructions will enable you to control your pet’s behaviors in a safe efficient manner. 1. The correction that you use must be effective. This may sound very obvious, but far too many people it is not. Use your common sense. If you need to correct the same behavior over and over again, try something else. Think of punishment like hitting yourself on the head with a hammer: If it hurts, don’t do it. 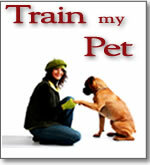 Many people follow any advice thinking, "It has to work, it worked for Fido." No two animals are alike and what worked for one very likely will not work for yours. Be flexible. 2. Animals must be given and rewarded for proper alternative behaviors. If you find a behavior unacceptable, you better be teaching what is acceptable, before punishing him for what is wrong. After a reprimand is administered, the animal must know two things: first, how can he avoid being punished the next time, and second, what should he be doing instead of what he did. If the punishment you give your pet is "instructional," you will be answering both of these questions for him. Show him what is "right", then reward that behavior consistently before you administer any punishment for what is "wrong’. Animals will soon learn that certain behaviors are met with worthwhile rewards and some are not. 3. The punishment must not be harsh. Personalities and sensitivities vary greatly. One animal may barely notice punishment at a level that would petrify another. The intensity of a correction should be sufficient to get the job done the first time, but no stronger. If the animal thinks that the punishment does not fit the crime, the lesson will be lost. 4. The punishment must be immediate. Animals must understand that the punishment is for the behavior they are exhibiting right now. Never attempt to punish after the fact. 5. The correction must be short. Many people catch their pet doing something wrong, give it a "spanking," then brow-beat or withhold food from the poor thing all day long. Just make the correction and call it good. The pet is not going to remember what brought on your wrath all day. If he looks "guilty", he’s not. He is thoroughly confused. 6. Your expectations must be reasonable. You cannot "stop" certain behaviors. Animals run, jump, play, eat, fly, bark, and meow. You can’t eliminate these behaviors, but you can certainly put acceptable limits on them. We offer a broad range of remote training devices and bark contol systems suitable for almost all training situations.